JUNO-106, as captured by cicciostoky [MySpace]. Roland is holding a YouTube video contest to get people to show off their JUNO keyboard synths. They’re not just talking the currently-available Roland keyboards that wear the JUNO badge, but the classic models going back to 1982. I think it’s worth reviewing the history of the JUNO line. What it’s meant to be a “JUNO” has changed pretty radically over the years; a JUNO-D and a JUNO-6 might not recognize each other. It reflects some of the changing tastes and technologies in the industry. Sometimes that represents forward progress — hooray, MIDI and patch memory! But sometimes something is lost. The analog original is something special, and even Roland wound up bringing back retro-styled front-panel editing, missing on the JUNO-D, to the JUNO-G and JUNO-STAGE. It’s not about nostalgia: it’s about making something musically productive. In some ways, that’s brought us full circle. Mirror, mirror: JUNO-6, photographed by p caire. 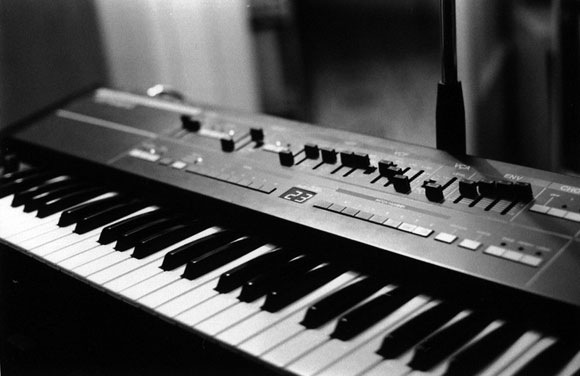 1982: JUNO-6, JUNO-60. The original JUNO was a six-voice polyphonic analog synth. The distinctive, punchy analog sound was so beloved, it even inspired a meticulous emulation on a dedicated Linux machine. 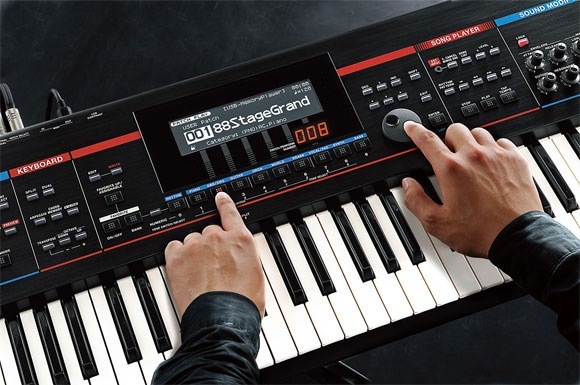 It also introduced Roland’s friendly-looking panel layout approach with big, clear labels and a spacious setup – something to which Roland themselves have recently returned. The JUNO-60 added patch memory storage. No MIDI, although there Roland later produced add-on hardware for MIDI control. Roland generations: the JX-8P was the successor to the first commercially-available Roland MIDI synth (JX-3P). You can also see how the JUNO-60 compares to the size of the JUNO-106 at top. Photo: Soundingblue. 1984: JUNO-106. The 106 has a special place in history, not only a favorite of the 80s but ever since – it’s got six analog voices as on the original JUNO, plus one digitally-controlled oscillator per voice, but adds MIDI control. It sounds great and it’s dead-simple to use. It’s also a nice choice if you’re looking to pick up an 80s keyboard as it’s a good value today as it was when released. In a world in which “vintage” often translates to elite and expensive, the JUNO-106 is one of the great populist keyboards of all time. Note that if you are looking to pick up a used 106, our friend James Grahame from Retro Thing notes tells me the voice chips are starting to die. Buyer beware: owning a used synth can be like owning a used car. The Roland Jupiter, not the JUNO, went down in history as one of the two first synths to connect in public via MIDI – at winter NAMM, January 1983, connected to a Sequential Prophet-600. But the JUNO-106 was still one of the Roland products that helped popularize MIDI. Digital oscillators + analog filters. Odd that we don’t have more synths like that today, in fact. Photo: ALERT ALERT. 1986: Alpha JUNO 1. The Alphas are smaller, and eschew physical controls for LED and minimalist button selections – there was something about the mid-1980s that did that to synth design. But you can add on a PG-300 controller for additional controls, the Alphas are MIDI-friendly, and not hard to find these days. They maintained the distinctive JUNO sound and have been a favorite in the techno scene ever since. Alpha JUNO 2. The Alpha 2 hits a nice sweet spot as a controller: aftertouch, 61-note keyboard. That could make it a decent choice on your keyboard rack even today. 2005: JUNO-D. The JUNO-D is a budget wavetable synth, and as such, really the odd man out here. The connection to the original JUNO is presumably that it’s a friendly synth with some favorite sounds, and it does support a computer editor. There are also front-panel envelope controls. But it’s the more recent JUNO models that have brought back more of the original spirit of the JUNO. The JUNO-D has “JUNO” printed on it, but otherwise, while a solid entry-level keyboard, it lacks a lot of the features that make the other modern JUNO line appealing. JUNO-G, at home in the studio. Photo: Claudio Matsuoka. reviewed the JUNO-G in summer 2007 for Keyboard Magazine. I was especially attracted to the ability to use your own waveforms as the basis of sounds, and to the front-panel editing and sequencing/recording features. Version 2 of the JUNO-G recently added waveform editing. 2008: JUNO-STAGE. I quite liked that the JUNO-G is light, but the JUNO-STAGE gives you a 76-note, semi-weighted keyboard and additional performance controls. It gets rid of some of the sequencing and workstation features of the JUNO-G, but if you want to do all your sequencing on computer, that may not matter. The idea of the STAGE is really focused on live performance controls. Like the JUNO-G, it’s the soul of a Fantom-X in a different package, but that package is more narrowly-focused in a way that can appeal for live playing. An informal poll reveals there are some JUNO owners – new and vintage – out there in CDMland. So I’m actually quite interested to hear what these results might be like. I’d love to hear your actual music and learn how you use these in the studio or live. Hopefully in the future, we can extend this to other popular gear, as well.